Probably not a topic that would interest many but I bought this book thinking it would be informative. I picked it up and was so engrossed in it I couldn't set it down. It took me two days to read it and it has given me a much deeper interest and appreciation for Amish lifestyle or the old way of doing things. 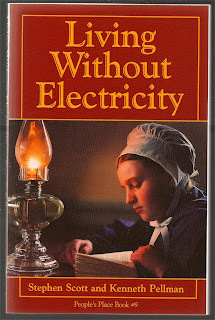 This book covers several topics and answers questions including How do you light a room without electricity? How do you cook? How do you get hot water? How do you keep warm? How do you wash clothes? How do you make clothes? What do you do for entertainment? How do you communicate without a phone? How do you farm with out electricity or a tractor? and many more. Although it doesn't go deep into each topic it does give the reader a good understanding of several areas.